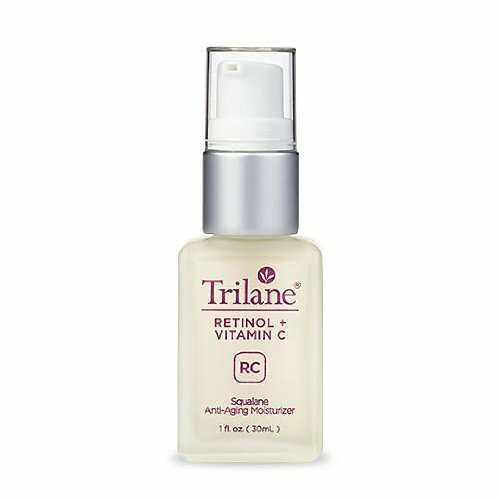 Today I am sharing my thoughts about Trilane® Retinol + Vitamin C from Healthy Directions. I have been trying this new moisturizer for slightly over a week now. Trilane states that the serum gives you everything original Trilane® Anti-Aging Moisturizer with Squalane offers, plus age-fighting and skin-renewing antioxidants to leave your skin smoother, more even, for a more radiant, youthful glow. Known for its ability to reduce fine lines, diminish brown spots,and speed natural cell turnover, retinol can often be a source of frustration for women, who, after use, experience dry, flaky, irritated skin. I have been using Retinol products for a while without experiencing any irritation, but then again I don't really have sensitive skin. The good news is that with Trilane Retinol + Vitamin C moisturizer, you don’t have to worry about any possible harsh side effects! When I tried the serum out for the first time, I immediately noticed that the clear serum feels silky, but not greasy. The serum blends retinol, vitamin C, and key botanicals, combines them with the ultra-hydrating squalane and firming jojoba esters found in original Trilane Anti-Aging Moisturizers. The combination of these ingredients creates a serum that give your face that wet, well hydrated look. A few drops of this powerful antioxidant-packed oil gently hydrates and reduces dryness. It leaves skin feeling extremely smooth and it penetrated deep into the skin to unclog pores. Over time the appearance of brown spots decreases as well. Products that contain retinol tend to make the skin sun - sensitive. I strongly recommend to apply sunscreen daily to protect your face from the harmful rays of the sun. I also wanted to share some independent research findings I have found about Retinol with Vitamin C that you might find interesting. Histological evaluation of a topically applied retinol-vitamin C combination. Seité S1, Bredoux C, Compan D, Zucchi H, Lombard D, Medaisko C, Fourtanier A. Two double-blind studies versus vehicle were carried out to investigate the effects of a topically applied retinol plus vitamin C combination on epidermal and dermal compartments of aged or photoaged human skin. The two studies were performed on postmenopausal women who were selected for treatment based on the mild level of elastosis of their facial skin. At completion of treatment, skin biopsies were collected and processed for classical histology and immunohistochemistry. In the first study (aged skin), 8 volunteers applied the retinol- and vitamin C-containing preparation on the ventral side of one elbow and the vehicle on the other elbow twice daily for 3 months. After the 3-month treatment we observed histological changes mainly within the epidermis. The stratum corneum was thinner with a compact pattern, whereas the epidermal proliferation increased, resulting in a thickening of the viable epidermis. Moreover, the interdigitation index was increased. In the second study (photoaged skin), 11 volunteers were divided in two groups; one applied the retinol- and vitamin C-containing preparation and the other one the vehicle on their face twice daily for 6 months. Facial skin samples presented histologic hallmarks of photoaging, i.e. accumulation of elastotic material in the papillary dermis. After the 6-month topical treatment, the observed histological changes were mainly concentrated at the dermal level. Both treated and control groups showed the same distribution pattern of type I procollagen, however, the high level of type III procollagen originally observed in photoaged skin was reduced in the retinol- and vitamin C-treated group, resulting in a lower type III-to-type I procollagen ratio. Furthermore, a wide band of eosinophilic material just beneath the epidermis, devoid of oxytalan fibers and forming the ‘grenz zone’, appeared more frequently and was larger in the retinol- and vitamin C-treated group. In conclusion, our results show that repeated topical application of a preparation containing both retinol and vitamin C is able to reverse, at least in part, skin changes induced by both chronologic aging and photoaging. — Copyright 2005 S. Karger AG, Basel.